IP sealing washers are used to provide an effective method of maintaining the Ingress Protection (IP) level of equipment when properly installed. Essentially, the IP level indicates the degree of difficulty “intrusions” can get inside electrical equipment, in this case cable glands. This includes intrusion by dust, water, body parts (fingers etc. ), and accidental contact.Maintain the IP level is integral to both the function of the device, as well as the safety of those using it. A falter washer inside a cable gland has the potential to cause major harm, so you will want a washer produced to the highest standards possible. That is where Kingpin comes in. We mostly produce standard entry thread and skid washers for the cable gland industry, although many other washer sizes are available on request due to our extensive tooling ranges. 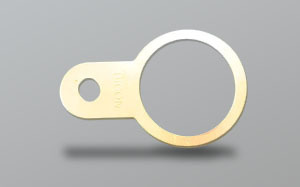 IP washers are produced on site and we pride ourselves on fast turn around times. Brass, fibre, and nylon washers can be made to any specific size requested and most of the standard cable gland fitting sizes are held Ex-stock for immediate despatch. We don’t just supply to the cable gland industry though. Our diverse selection of washers means that we can supply to electrical manufacturers up and down the size scale – from consumer products to heavy industry. Kingpin have supplied washers for light switches all the way up to oil rig electrical components. So regardless of size, material or purpose, Kingpin can manufacture the exact washer you need, from heavy duty rust proof stainless steel washers, to minuscule brass washers. Thread forms ISO Metric, NPT, PG,NPS,BSPP,BSPET and ET are all held in stock. Materials Nylon6, Nylon66, Fibre, PTFE, Neoprene and Brass are available on application. All washers we produce can be made in sizes M1 to M130. 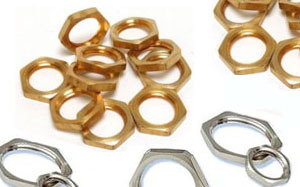 Additional washers cover flat metallic, serrated, toothed, and lock washers, brass strips, brass rods and brass hex. – High in quality – We are a trusted name within the industry, thanks to the consistent high standard of parts we produce. – Customised to your material of choice – As you can see, we have a variety of standard and non-standard washer materials in stock. – Available quickly – We pride ourselves on our lightning quick turn-around speed, a result of years of experience and high quality machinery. Combined with our competitive prices, this is a package that is nigh-on impossible to beat! Kingpin also produce various sizes of locknuts, which help secure the gland in place, available in a range of materials.